I started a new game and I was running out of time before SoD release! So, I had the idea of creating a mod that would allow me to summon any NPC in the game and get the items I could legally obtain if I completed a full playthrough. With this mod you'll then be able to form a fully equipped and SoD ready party. Then, install the mod by double-clicking the 'setup-abel_bookoflegalpossibilities_mod.exe' file. When you're in game, you need to create the book by opening the console (to enable it, check this thread; then open it with CTRL + SPACE) and by typing in: 'C:CreateItem("BLBOOK01")'. The item will appear in your inventory and you can assign it to a quickslot. Upon use, a dialog will trigger and offer the options I mentioned first. 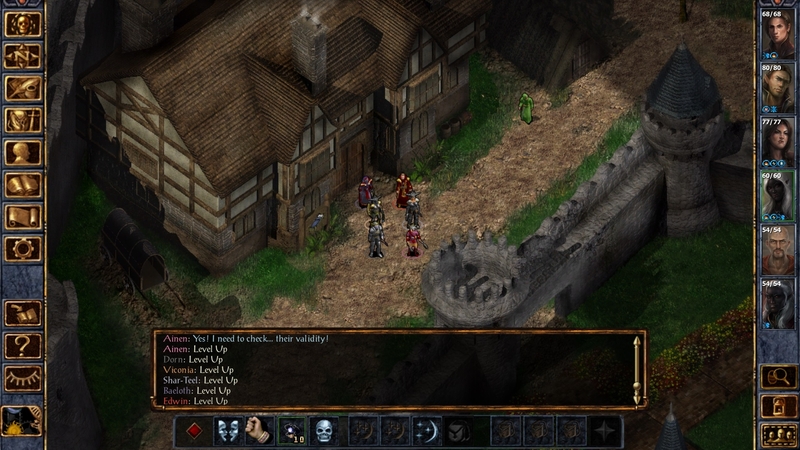 Warning: this mod lets you recruit NPCs directly by bypassing their original first lines of dialog. This is necessary for several reasons. The drawback is that it may prevent certain variables from being set normally. So, use this in a normal BGEE campaign at your own risks! Additional notes: unfortunately, I wasn't able to set the items price to 0 (it's 1). So depending on your current gold, you may have to create some ('C:AddGold(999)'). I did my best to create an accurate list of the items you can get and their quantities. But, I'm not sure about the exactitude of it all. You can help me improve the list by reporting any mistake (I included a complete list in the spoiler below). Especially regarding spell scrolls which I added liberally (2 per spell) not knowing about their presence or absence (but for the most patent ones). Only magical items were included. There are a few exceptions (armors). I also had to decide what to do for consummables, projectiles and wands. I decided to add a stack of 8 potions, 80 ammos per type and 8 charges per wand. Feel free to 'buy' these special items... or not! Evil party ready for SoD! That's exactly what is needed! Thanks for this great work! @bengoshi Thanks, glad it will serve! Please test it as well as you did v2 (though it should work without problems )! I don't think you actually need to get a Final-Save to import to SoD (was that your point?). You can import from any save. It it were needed though, you could just do a simple C:MoveToArea("AR0125") and kill everyone with CTRL+Y. Thanks for making this, it's a brilliant idea. I've been bogged down in durlag's tower for ages and I forgot to back up my installation before the update so all my mods were wiped out. this means I can recreate my character and play from where it's fun instead of having to force myself to finish bits that I hate (plus I can skip faffing about with mods). @wubble Thanks for your feedback! Indeed! I saw that myself. I've found a couple of minor annoyances that I will be updating when the SoD excitment goes back to normal ! @bengoshi @wubble and all, the mod was updated! I thought it'd be actually stupid to wait before updating it since it's most needed now. See v2 notes in the original post. I'm still using a store for the items but it could be a bag of holding. What would you prefer? The mod seems to be working for SoD too so you can always use the book there if needed! 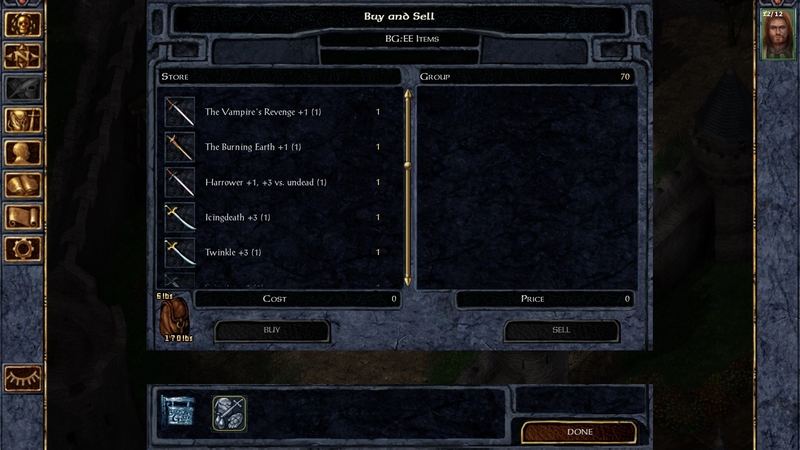 I quite liked the store, it worked well, it also means you can put items straight into your party member's inventories. Little update! Put the project on GitHub to keep tracks of various versions (see original post for link). The last release now contains new stores from the Black Pits (all items you can buy) and for SoD. The SoD items weren't filtered, it's a basic add so you'll find everything (relevant or not) with default quantities, etc. I personnally use it to see descriptions. @ahhyep You shouldn't need chapters if you intend to move on to SoD directly. If by special abilities you mean Bhaal powers you get from dreaming, then yes, you can get them!